For the vast majority of patients, their top three complaints in order of importance are a “bump” on profile, a lack of tip definition, and a wide nose. Two of these three problems are associated with the dorsum, especially when a “balanced approach” is employed. Anatomically and embryologically, the bony vault and cartilaginous vault are fused into a single entity—the osseocartilaginous vault (OC). 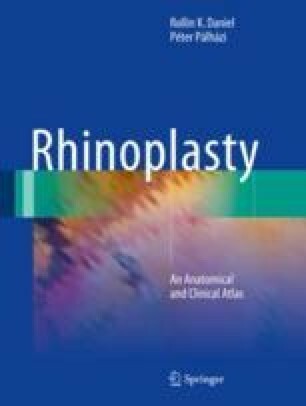 During the past 5 years, major changes in surgical techniques have dramatically changed our approach to hump reduction, mid-vault reconstruction, and osteotomies. We strongly advocate rasping off the bony cap to expose the intact underlying cartilaginous vault. Next, the upper lateral cartilages (ULCs) are split off from the anterior septum and reserved for possible spreader flaps. Then, the dorsal profile is lowered by resection of the anterior dorsal septum using scissors. Many types of osteotomies are available, including lateral, medial, and intermediate. The recent introduction of piezoelectric instrumentation (PEI), with its extensive exposure and precise cuts, has led to greater precision in bony vault management. Once the bones have been mobilized, the surgeon must reconstruct the mid vault, using either spreader grafts or spreader flaps. When dorsal augmentation is required, it can be done using autogenous tissue with diced cartilage in fascia (DC-F), which is our preferred technique. Ultimately, the major advances in how we approach the dorsum have resulted in improved aesthetic and functional results.